We arrived in Punta Arenas after a two and half hour ferry ride across the Straits of Magellan. After a very challenging first week of cycling, it was nice to be heading to the mainland, crossing our fingers that we'd be escaping the harsh winds of Tierra del Fuego. After two nights at a hostel in Punta Arenas, meeting other travelers (some from New England! 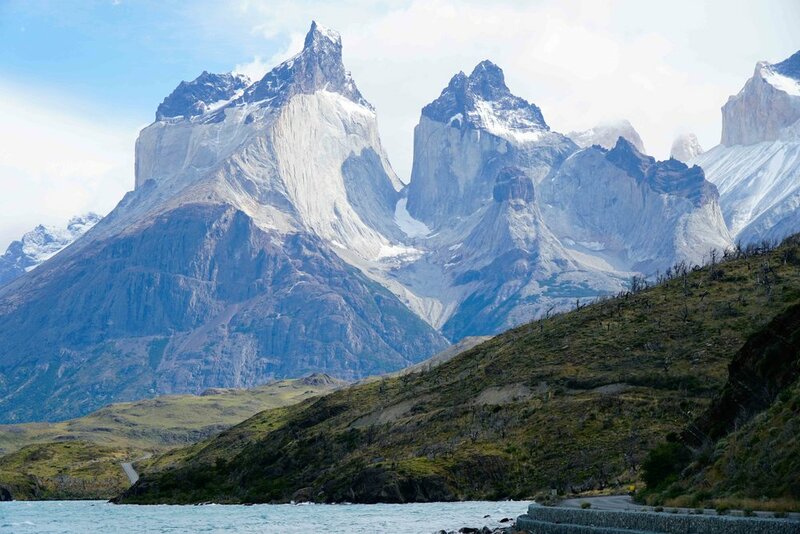 ), resting, food shopping, etc., we hit the road again and headed north towards Puerto Natales - the real gateway to Torres del Paine, and the section of the trip we'd all been looking forward to. Though we had a great start, leaving Punta Arenas without too much wind, it soon returned and left us feeling discouraged. 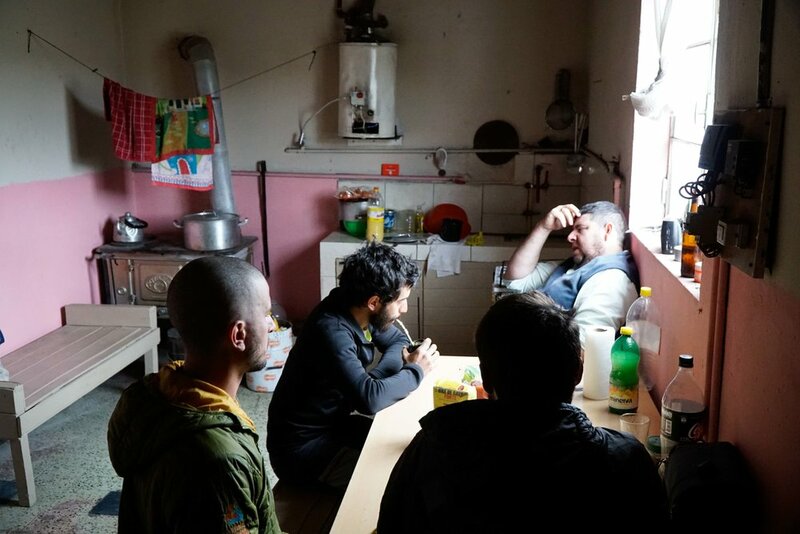 After just 40-50 kilometers, we sought refuge in what appeared to be an abandoned house next to a lake. After poking around for a minute, an older gentleman, Juan, appeared and explained to us that he was working on the property by himself and that we could stay and escape from the wind. We obliged, and hunkered down for the night, winds gusting all night long. The next morning, we joined Juan for some coffee and conversation (photo #1) and learned more of the history of where we'd slept that night. Sharing coffee and talking with Juan was a reminder of the aim of our trip - to connect with others seemingly so separated from our own realities back in the U.S. It reminded us that we wanted to do what we could to have as many of these experiences as we could, knowing that it was times like this that we'd remember most. Soon after pushing off again, the wind picked up and tested us all over again. After another 55 kilometers, we were done and still had over 100 kilometers of unrelenting windy roads left to ride to Puerto Natales. Though we'd already been faced with hitch hiking once before and agreed that we wanted to do everything we could to ride the whole way home, we also knew that riding at less that 10 kilometers per hour through some of the desolate plains of southern Patagonia is not where we were likely to meet people and see what we came to see - add in the fact that we had limited food, and it was time to stick out the thumb one more time. Fortunately, Bryan, and his salmon hauling tanker truck came to the rescue (photo #2). 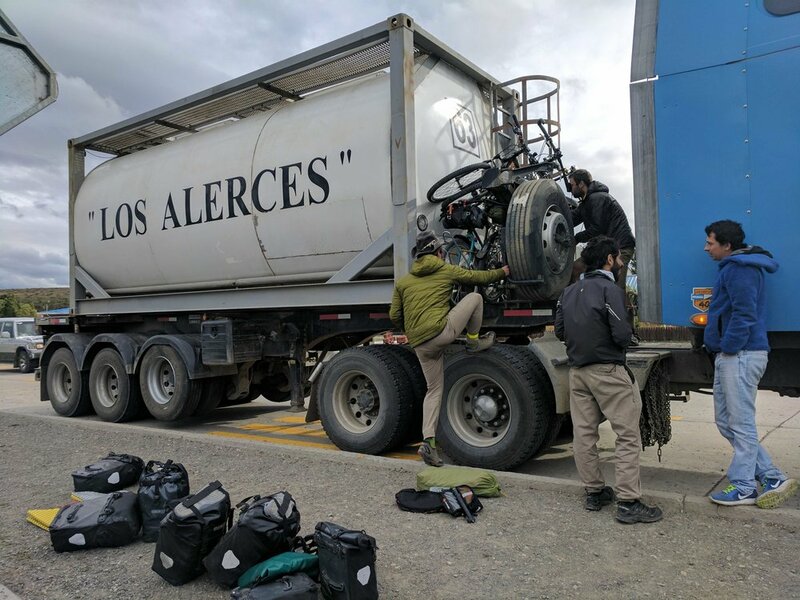 After tying the bikes on, we all hopped in the spacious cab and sped off to Puerto Natales, relieved that we'd be back on track and headed towards Torres del Paine the next day (photo #3). 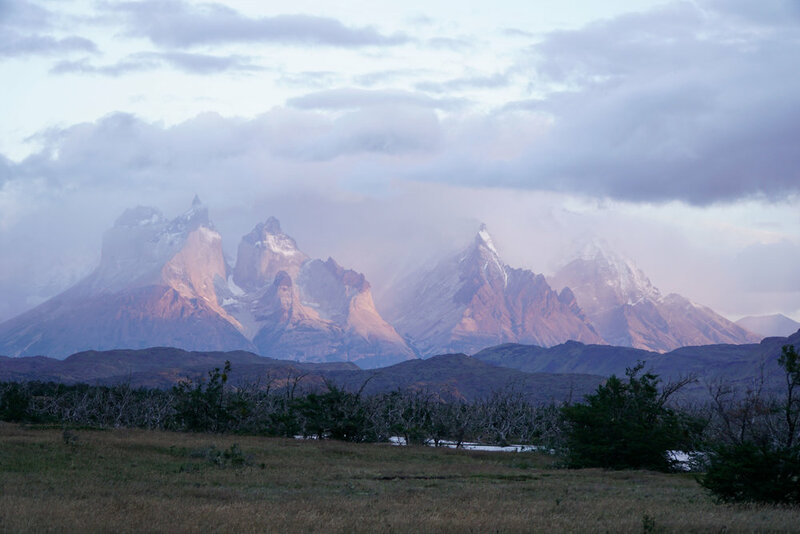 Waking to an idyllic scene of snow-capped peaks, we loaded up and headed to Torres del Paine, following meandering dirt roads (rippio) straight to the park border where we came upon a pay campsite that supplied us with wood, hot showers, and a sheltered picnic table for cooking. We prepped for the next day, and headed to sleep early, knowing that we would try to ride the entire park the next day. After a day off in the sleepy (and eerily deserted) border town camped outside a bus station, we headed back across the border into Argentina to head towards El Calafate. 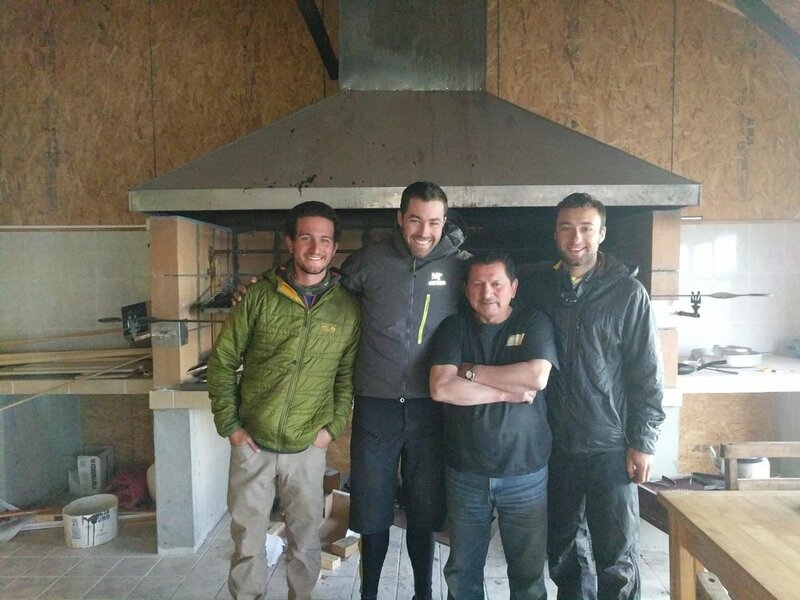 Our friend, Andres (who had been with us since Rio Grande almost two weeks earlier), was happy to be returning to his homeland. Despite a late start, we finished the first 60ish kilometers with an epic tale wind and plenty of daylight left to ride - and good thing, as we'd been told that the next 65 kilometers of rippio would be the worst we'd see maybe for the entire trip (photo #14). In good spirits, we hit the rippio and were making good progress until it started raining quite heavily. Lucky again, we came upon a lone house about 30 km into the rippio, where we joined three French cyclists and our host for the night, Marcelo. Marcelo had worked shearing sheep for the season (at a rate of 1,000 per day) and had stayed on as a caretaker on his boss' property (photo #15) .He generously showed us bunks where the Gauchos would normally stay and offered showers and soon to be ready huge pot of guiso (tomato based stew with lamb, sausage, peppers, onions, pasta, etc. - a perfect meal to follow a wet end of our long day). After cranking out the last 35ish kilometers of rippio (and fender clogging mud... literally had to take the wheels off and clean out the mud to keep the wheels turning), we were back to pavement and ready to crank out the kilometers. With just 92 km to El Calafate, and a good tale wind, we decided to shoot for the full 135 km, knowing that, if we made it that night, we could likely find a hostel and could take a rest day to recuperate before heading out to El Perito Moreno Glacier the next day. And, by around 11 pm (not long after sunset down here - photo #19), we'd done it - almost 85 fully loaded miles to our next stop El Calafate. That wraps up the story until next time, but keep an eye out for upcoming entries documenting our visit to El Perito Moreno, El Chalten and saying goodbye to our dear friend, Andres, Lago del Desierto, and our overland crossing to Lago O'Higgins and the beginning of the famed Carretera Austral!